Having a veg box delivered featuring both Welsh and English produce helps keep eating seasonally in check. 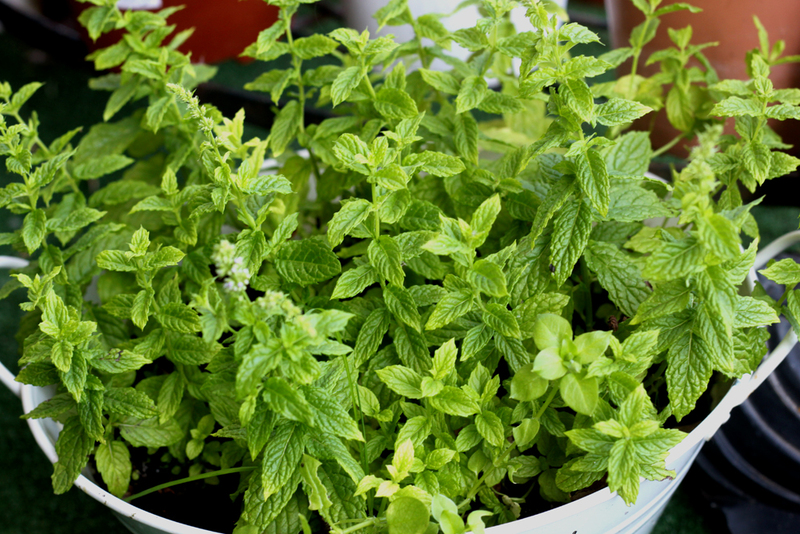 As the summer continues, I also have an abundance of mint plants expanding across my balcony garden. So with bags of peas in pods and new potatoes from Gower and a few sprigs of homegrown mint, I thought some little potato fritters would do nicely for a small person’s dinner last night, or a lunchtime snack. 1) Pop the peas and place them all into a medium saucepan with the potato. 2) Cover with water, bring to the boil, then turn down to simmer for 15 mins until pots are soft. 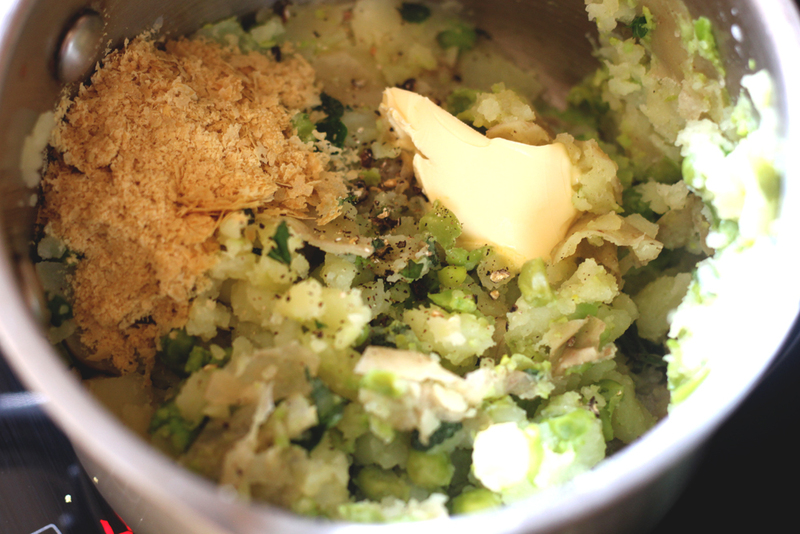 3) Drain peas and pots and add in all the other ingredients into the saucepan. 4) Roughly mash everything together with a potato masher. Taste, then add more seasoning or yeast flakes if required. 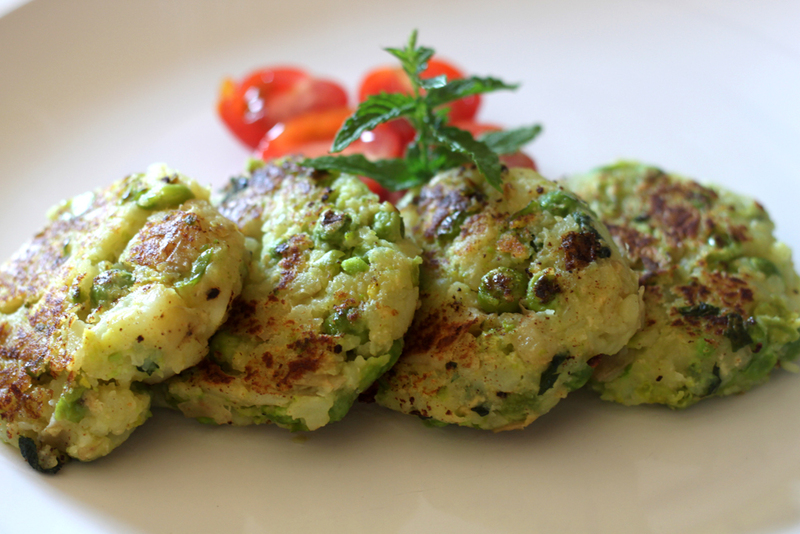 5) Shape into four fritters and fry in olive oil in a wide frying pan, on a medium heat. Turn over once the fritters are golden on one side. 6) Serve with tomato salad. 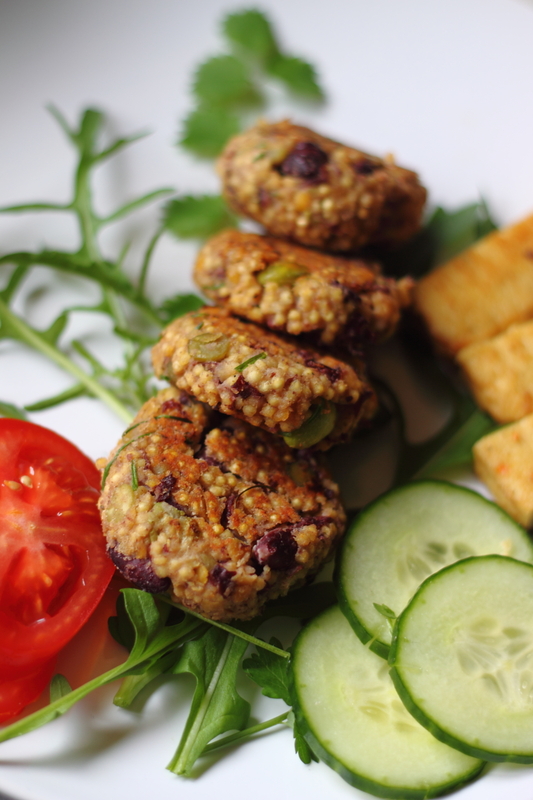 While I’ve been concentrating hard on building my new yoga business, Womankind Yoga, I’ve had little time for food writing sadly… so it was a real pleasure to be invited to become part of the new Suma Wholefoods Blogger’s Network, giving me the opportunity to get back in the kitchen with the camera for a couple of hours! 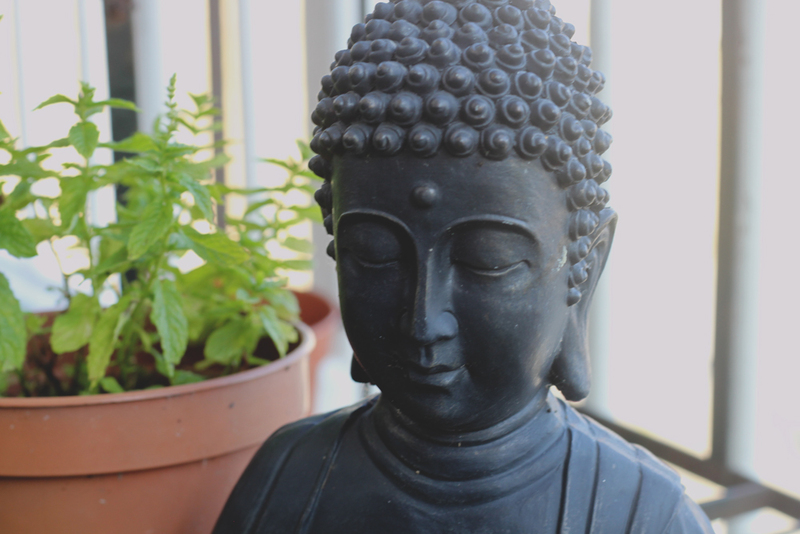 Specialist Wholesalers of Vegetarian, Organic & Fairtrade produce, Suma Wholefoods have literally hundreds of lovely vegan products to choose from, ranging from cupboard staples, to the latest animal-free foods on the market. 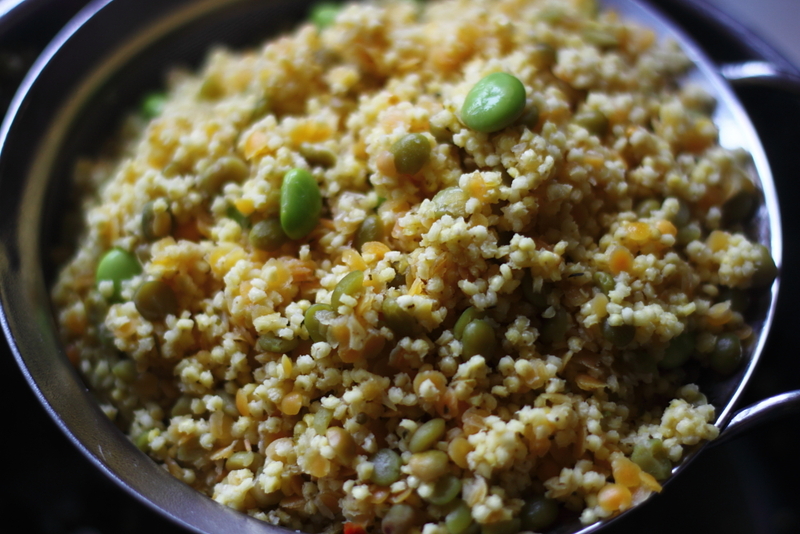 Most of the ingredients used in the recipe below can be purchased from Suma. 1. Cook the grains according to the packet instructions for 10 mins. Add in the edamame after 5 mins. 2. 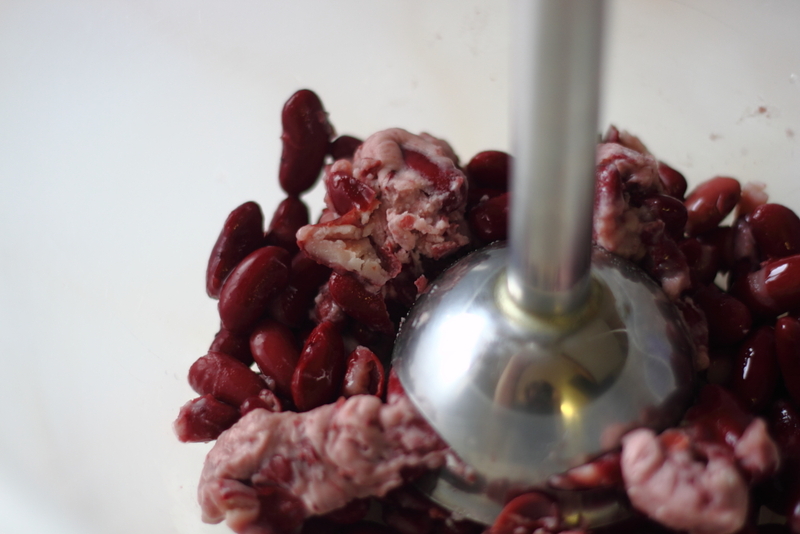 Meanwhile, part blend/mash the kidney beans with a hand-blender, keeping some whole. 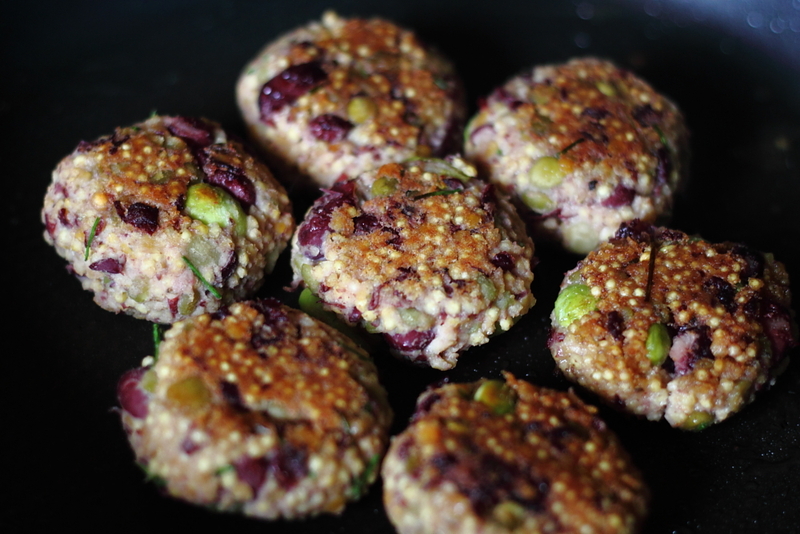 This is what binds the burgers, alongside the quinoa flour. 3. Drain the grains and edamame and tip them into a mixing bowl. 4. 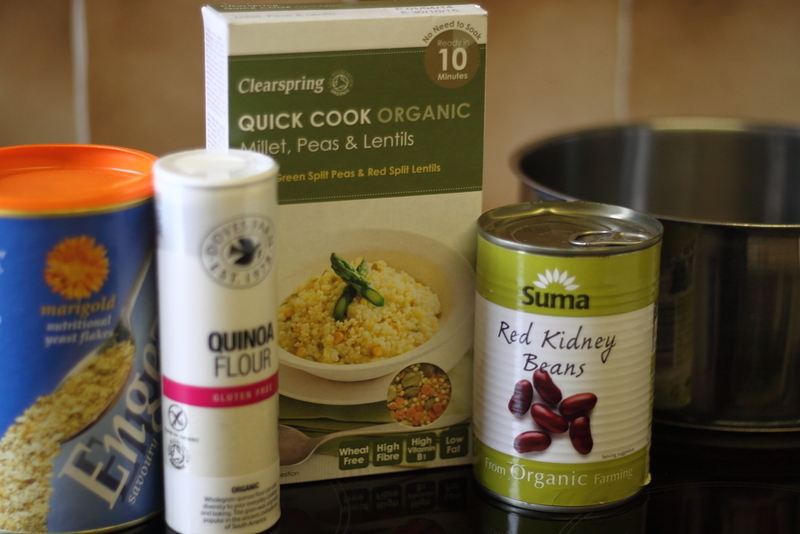 Add in the kidney beans and all the rest of the ingredients. 5. Mix everything together with a wooden spoon, then with your hands. The mixture should bind well and hold together when you take a small handful and shape it in to a burger. 6. Either make 6 large or 12 small burgers from the mix. 7. Heat some olive oil in a non-stick frying pan. Cook the burgers on a medium heat, turning over when they turn a golden colour. They should only take a few minutes to cook on each side. 8. 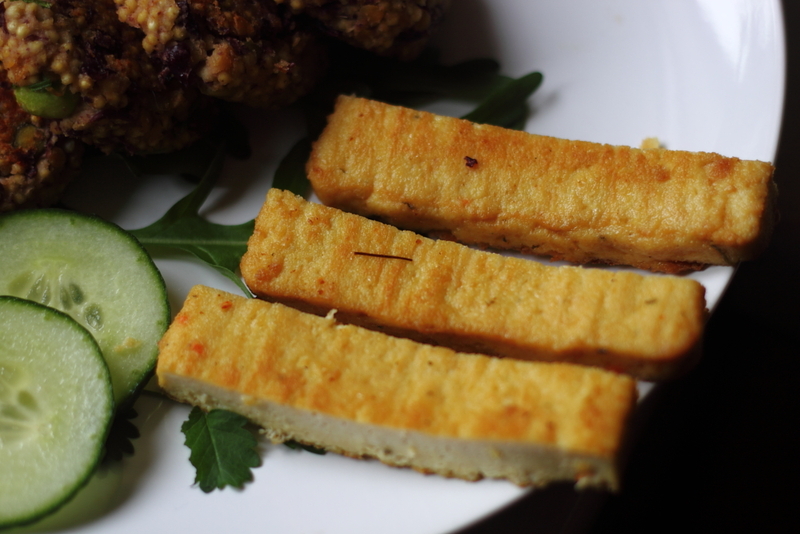 I served the burgers with salad, hummus and Taifun Tofu Fillets, fried and then cut into chips. While I’m awaiting delivery of a new juicer, I was craving a raw energy boost from some green vegetables. It’s a good job raw broccoli is packed with vitamins the amount I’ve been eating lately! This salad was no exception. Plus, with the news today that we should all be eating seven portions of fruit and veg a day – this salad totally hits the spot, with five! Tahini is also a good source of calcium, magnesium, iron, vitamin B1 and zinc. 1. Mix all salad ingredients together in a serving bowl. For the dressing, whisk the ingredients together with a fork. 2. 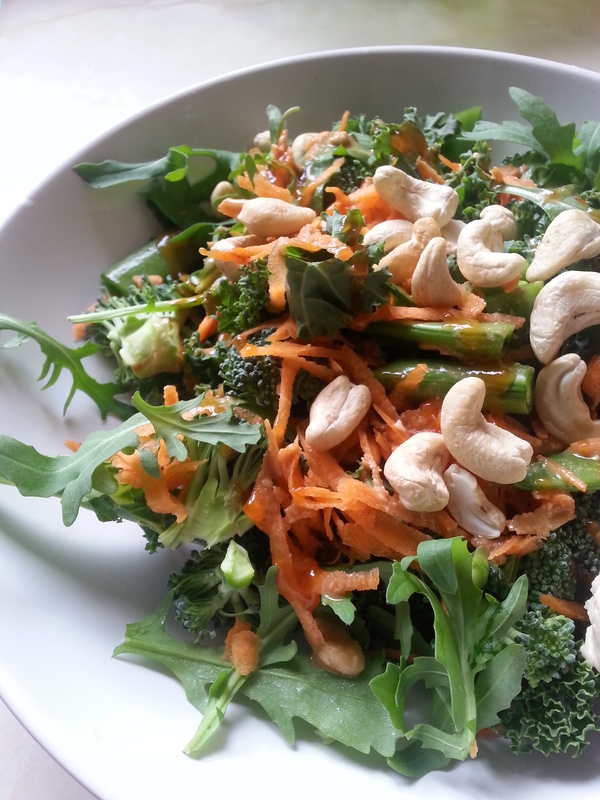 To serve, drizzle the dressing over the salad and top with a little sweet chilli sauce and hummus. Recently I fancied making some little bite sized snacks suitable for a lazy sunny Sunday morning. 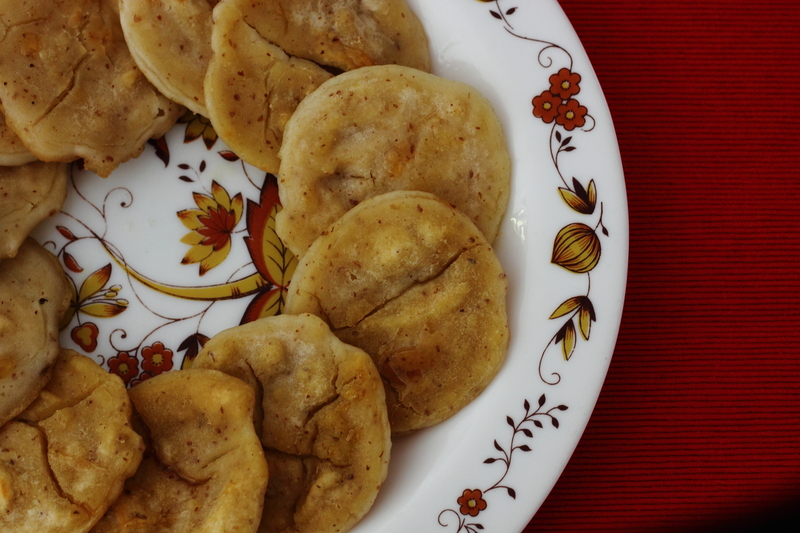 I’ve been experimenting with rice flour and recalled having little rice flour pancakes years ago. I thought I’d try making some little pikelets and add some ground flaxseed for an added nutritional boost. I served them with agave nectar and they were crispy and tasty. The great thing about these pikelets is that they are wheat and gluten-free, vegan and contain good omega fats from the flaxseeds. 1. Mix all the ingredients together in a bowl and beat with a small hand whisk. The batter won’t be smooth but don’t worry. 2. Heat 2 tbsp olive oil in a frying pan and spoon in tablespoons of batter. Smooth them out into little rounds and cook them on one side until they are golden and crispy, before turning and cooking the other side. 3. Serve drizzled with agave nectar. 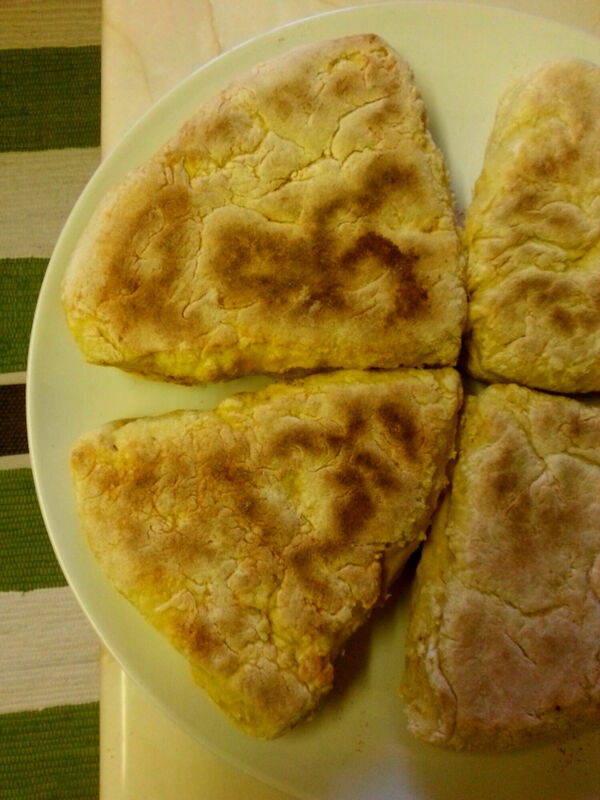 Preheat heavy based frying pan on medium to low heat.Place flour and salt in a bowl and sift in bicarbonate of soda. Make a well in the centre and pour in the plant milk. Work quickly to mix into a dough and knead very lightly on a well floured surface. Form into a flattened circle, about 1cm thick and cut into quarters with a floured knife. Sprinkle a little flour over the base of the hot pan and place each quarter into the hot pan, one at a time, until the 4 quarters create a complete circle. Cook the farls for 6 to 8 minutes on each side or until golden brown and cooked through. You may have to cut through the centre cross to turn them over. Take the pan off the heat and allow the farls to cool in the pan for 10 or 15 minutes. Recipe adapted from All Recipes UK. 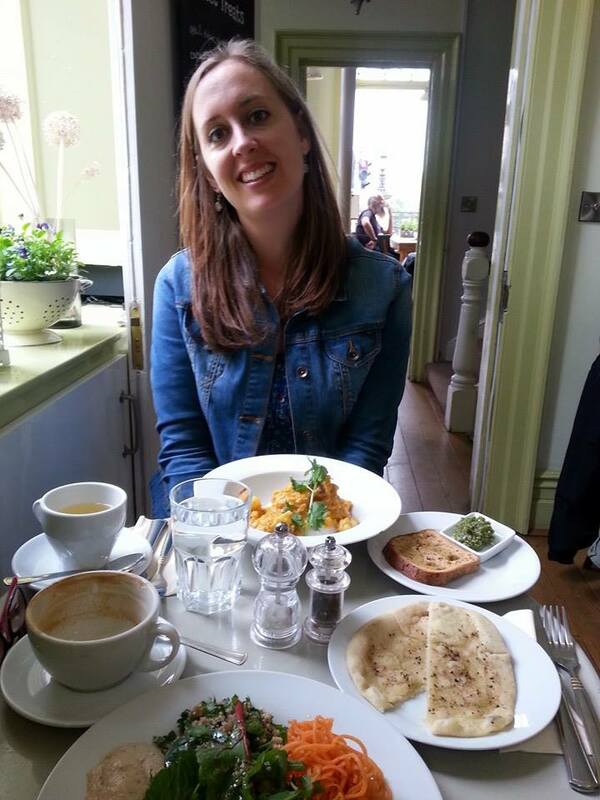 Whenever I was in London, I’d always make eating out at at one of the amazing selection of veggie and vegan restaurants a priority. This often involved a visit to the famous World Food Cafe, based in Covent Garden for twenty years. 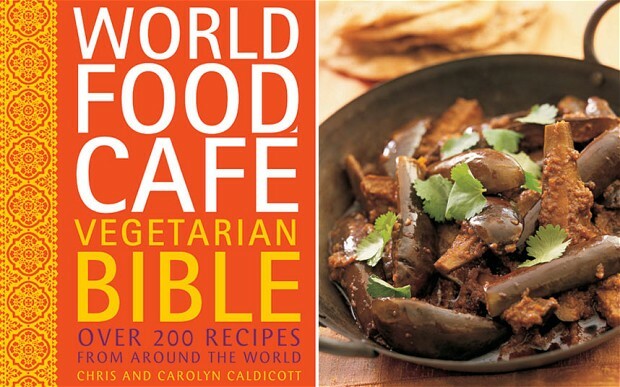 So I was delighted to recipe a copy of the World Food Cafe Vegetarian Bible through the post for review. Published this month (RRP £20) it collects together over 200 dishes, including 130 suitable for vegans. Recipes gleaned over two decades of globetrotting are tried and tested to be easy to make at home, by Chris and Carolyn Caldicott. Every recipe tells a story, through beautiful landscape photography and anecdotes of how the dish was discovered and how they have served it in the restaurant. From India, to North Africa & Arabia, South East Asia and Central America, there are many dishes you won’t have heard of or may have only been lucky enough to encounter once in specialized restaurants themselves in large cities. This is a book for people who love vegetarian cookery and exploring new colour and flavour combinations. If you have a healthy spice cupboard you will have a good basis for many recipes. It’s what I call a ‘daydreaming cookbook’, amongst those kept by the coffee table to look through of an evening, then pick a recipe to try on a Saturday night or if you have guests for dinner. Many of the recipes involve a generous list of ingredients, some requiring access to a good Asian supermarket. 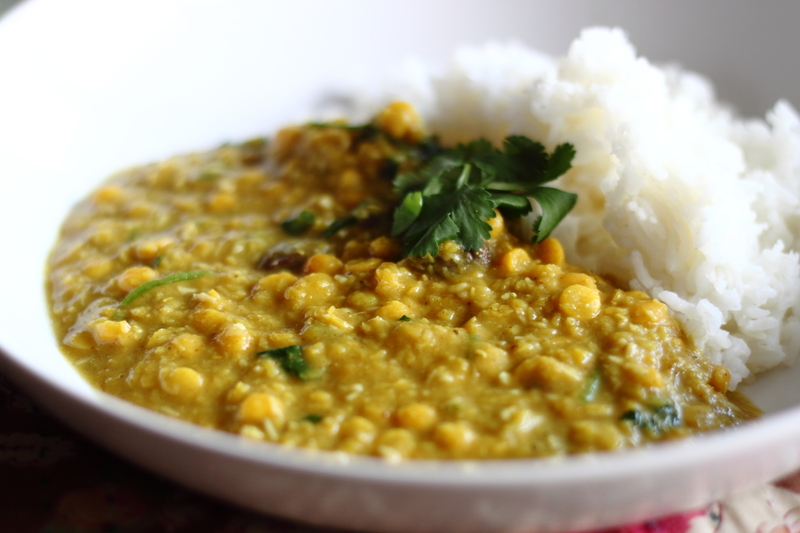 What better way to try out the Vegetarian Bible, than to make a dhal from it. Every region in India and individual it seems has their own way of making dhal (and spelling it). This one was different from my method, yet totally delicious; packed full of warmth, flavour and comfort. I’ve adapted the recipe slightly. Place channa dhal in a saucepan with water and bring to the boil. Remove any foam that rises to the surface. Add the turmeric and chilli powder, cover the pan and gently simmer until the dhal is soft. Mash dhal with a potato masher to break it up a little. Combine the coriander, cumin and garam masala with a little water until a paste forms, and add to the dhal along with the green chillies, sugar and salt to taste. Continue cooking for a further 5 mins. Heat the margarine in a small frying pan. When hot, add the coconut and raisins and fry until golden. Add the bay leaves and garam masala, fry for 1 min and pour on to the dhal. Serve with rice.